“Don’t be afraid of your fears. They’re not there to scare you. It’s always a huge event running one of my art workshops. I supply ALL the materials, including lovingly prepared textured surfaces for my students to paint on. It all takes weeks of preparation to create these. All the supplies eventually get loaded into my lovely little white van, and set up for the workshop over several hours. That’s in my home town of Perth, and the van travels about 6 km to get to the workshop. Doing this in Melbourne is a whole different story. In a few hours I will embark on a 6000km round trip teach Painting For Beginners over one intensive day. And then, I will turn around and return to Perth. I’m not even going to try to explain how I fit the contents of my van into 2.5 suitcases. Why the heck do I do this? I haven’t completely worked it out, but I have an idea. It’s all about Courage. You see, even though I’ve taught this workshop a gazillion times and I LOVE every single one … and even though doing it in Melbourne isn’t new for me (this is my fourth time), travelling across the country just to offer this work still scares the bejeebees out of me! But I do it anyway, cos I have this inner drive to challenge myself and push against these fears. Possibly because for most of my life I was a bit of a wimp, and finding art helped me to un-wimp myself in ways that seem unrelated to art. It helped me find my courage. I was married to a fearless man for 27 years, and he lived and died with so much valour, that I find myself thinking about courage. A lot. So here’s what I reckon: Broadly speaking, there are three types of courage. The courage to face a lion. Well, not an actual lion, but you know what I mean. The one that draws on our primal responses of fight or flee. The one that helps men and women in battle or save someone’s life without a thought for their own. The courage to wake up every day. And keep going with hope in your heart, when your life is just hard. It could be that you have a sick or disabled child, a partner who is dying or maybe you live in a terrifying neighbourhood. Or maybe it’s just hard being inside your head. The courage to widen your boundaries. This is a funny one. When you CHOOSE to do something that scares you. Just because. I’ve not had a great deal of experience with lions, metaphorical or otherwise, and I’ve had a ton of experience with number 2. I learned a heap from looking after both my daughter and my husband as they battled chronic, life-threatening illnesses. I saw courage in action every day from both of them. And the experiences were tough and heart-breaking but they enriched my life and definitely made me braver. But number 3 is the one that lights me up. That’s the one that I see in my students’ eyes when they come to my workshops and fight their fears of facing their own creativity, often for the very first time ever. 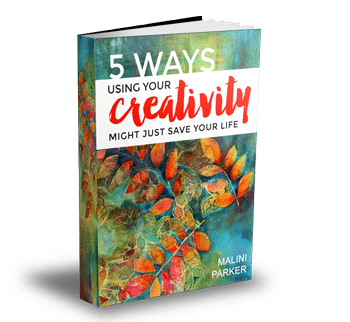 That’s the one that I face every time I create something new and navigate the treacherous waters of overwhelming uncertainty that comes with any creative endeavour. If you missed out on my Melbourne workshop, I’m running two more in November! This March sold out in a few days, so I’m giving you plenty of notice! You can book now over here. are now up over here. There are just 3 left. roarr Malini you awesome lioness of courage. Awww that is so sweet Sush! 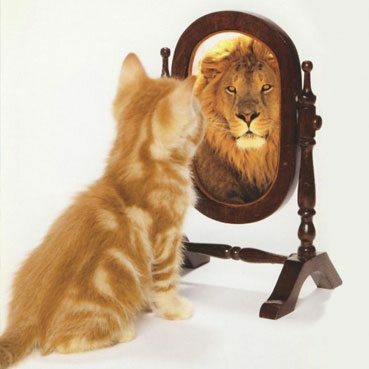 Sometimes it feels like the image is reversed, there’s a lion standing in front of the mirror and a kitten is reflected back! !